ORIGINALLY refurbished in 2003, and painted in an attractive all-over orange colour scheme with the classic RMC diamond logo, the 15 long-stored PCA Presflo wagons (Nos. 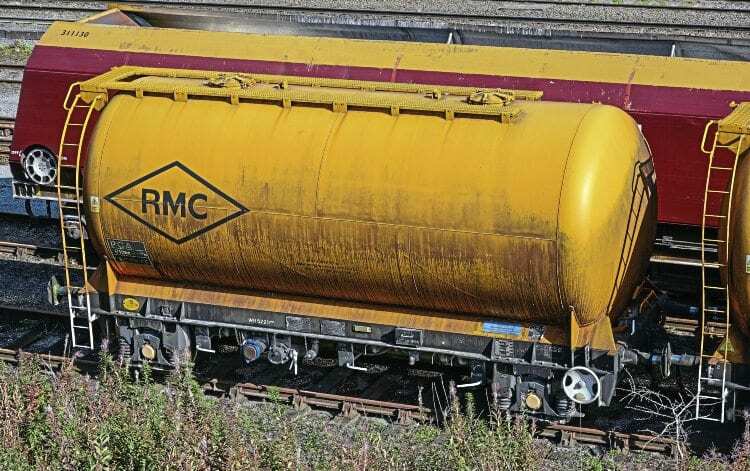 RC 10025-8/33/4/8/40-3/5/7-9) now owned by Cemex are being disposed of. Funded in part by a Strategic Rail Authority (SRA) grant of over £500,000, the former Rugby Cement ‘Presflos’ (built by Procor in 1981) were employed for a new-to-rail flow of lime mortar powder between RMC’s Dove Holes Quarry (Derbyshire) and Bletchley. This appears to have ceased operation in 2011 and the wagons were mostly stored at Peak Forest. The first movement of seven wagons, Nos. RC 10026/8/33/4/40/1/3, was completed on September 6 with their arrival at EMR Kingsbury (Staffordshire). The second batch of five, Nos. RC 10025/38/45/47/49, was despatched to EMR Attercliffe (Sheffield), arriving on November 24. This just leaves No. RC 10027 at Warrington Arpley and Nos. RC 10042/8 at Peak Forest awaiting their final journey. Also refurbished around the same time and now redundant are the VTG JIA Polybulks (UIC code Uafoos) used most recently for transporting lime from Hardendale (Cumbria) to Lackenby (near Middlesbrough). These are victims of the cessation of steelmaking on Teesside. A total of 26 of the 42-year-old wagons (part of an order of 65 built by Fauvet Girel in 1974) had been stored at AV Dawsons in Middlesbrough, but these have all now been moved to C F Booth, Rotherham for cutting. GBRf performed the sad duty, transferring the former Traffic Services Limited Polybulks south in two batches. On November 11, No. 66722 took Nos. 70 9382 005/006/009/013/014/015/019/026/028/044/048/052, while two weeks later on December 14, No. 66717 was in charge of Nos. 70 9382 000/003/007/ 008/012/017/027/034/040/041/046/047/049/051.